EU foreign policy chief Federica Mogherini on Thursday said the bloc and its member states would seek to find "practical solutions" to ensure its migrant rescue operation continues to fight human trafficking in the Mediterranean. Rome has asked the European Union to modify the rules of the Sophia mission -- currently commanded by Italy -- and rotate the ports where migrants rescued at sea can disembark, with France and Spain expected to top the list. Currently all the ships dock in Italy, but Rome's new right-wing, nationalist government says it should not have to carry the burden on its own and it is time other EU states do their fair share by taking in more of the migrants. In comments after informal talks by EU defence ministers, Mogherini said finding a solution to continue the mission, which ends at the end of this year, "will not be an easy exercise". "We finalised the meeting with an understanding that we will continue to work together... to find a consensus on practical, sustainable solutions on the issue of how to manage the people that are disembarked by the vessels with a constructive, cooperative and responsible attitude from all member states," she said after the meeting in Vienna. "Losing this asset would be a major step back for all member states and for the union and would be negative for the security of the Mediterranean and also for the security of the people we're talking about." She said one solution would be to have more ports for disembarkation -- as Italy has proposed -- while another could be relocation after disembarkation. If Sophia, which was set up three years ago to fight human trafficking, fails, more people could arrive again over the dangerous sea route, she warned. Italian Defence Minister Elisabetta Trenta said the talks "could have been better" but she placed her hopes in a meeting of EU foreign ministers that also takes place Thursday and Friday in Vienna. "I have to say that I found open doors but also closed ones," she said. German Foreign Minister Heiko Maas said his country was ready to take on a share of responsibility together with other willing partners. "We need Sophia, now and in the future," he said in Vienna before attending the foreign ministers meeting. German Defence Minister Ursula von der Leyen told reporters before the defence ministers meeting that she expected EU leaders to solve the question of how refugees should be distributed among member states and how those whose asylum claims are rejected should be returned home. "That is the question that is anyhow right on top of the agenda of EU leaders... and so I expect this question to be solved in the autumn," she said. EU leaders will meet in the Austrian city of Salzburg in September to discuss the migrant crisis. Austria currently holds the EU's rotating presidency. According to La Stampa newspaper, Italy's idea is to rotate landings between Mediterranean ports, with a particular emphasis on France and Spain, and with Greece and Malta also sharing the load. Italy has been turning away ships with migrants rescued at sea in a campaign to make EU countries take their share. 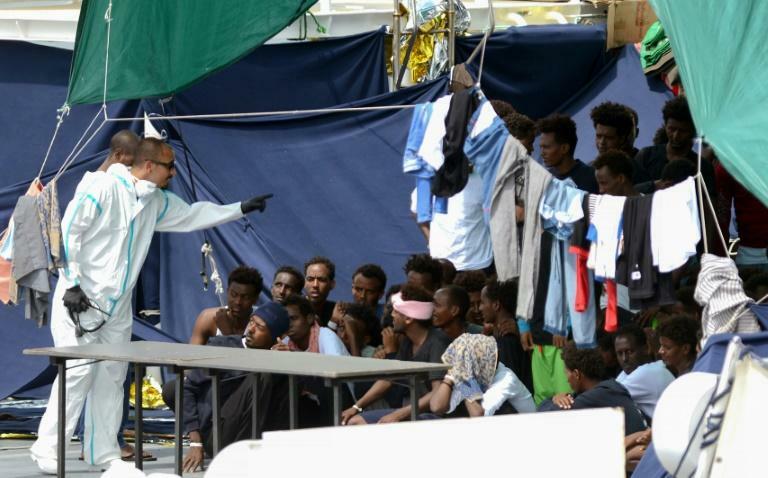 Last week, it threatened to stop billions of euros of EU funding over the issue, accusing Europe of turning its back as Italy grapples with seemingly endless migrant arrivals.